Elite XFIT T20 Treadmill is another entry level treamill machine, now available in a very affordable price. 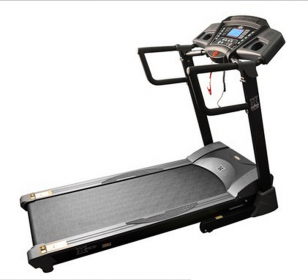 Best suited for jogging at home, this treadmill have enough jogging space and is run by a 2.5 PHP motor. XFIT 20 treadmill supports elevation upto 15%, which in turn can burn 40% more energy that walking on a flat machine. It is also convenient to fold and even displace from one place to another. *Note: Most of the sites, stores or shopping portals listed above sell Elite XFIT T20 Treadmill with discounts and other exciting offers. There is a possibility that the some of above websites are not selling Elite XFIT T20 Treadmill now. Toughtrain.com is not liable for such cases or instances. Also we do not recommend any seller for Elite XFIT T20 Treadmill and a buyer should buy from where he/she gets best deal with quality of products, service and on time delivery (shipment).